To get this out of the way, I'm an established GitHub user. My configs are set and certs are in place. I can continue to push, pull, clone from GitHub normally. I confirmed that my project's .git directory was normal. Having confusion, I deleted the folder and started again (thinking that I had perhaps missed a step, fat-fingered something, etc), but came up to the same problem. To ensure that my account wasn't broken, I tried cloning, pulling, and pushing repos, and found that they were working well. Cut to yesterday morning with no change, I went to delete the repo on GitHub but noticed that on this error page, the Admin button is not available. Finally I sent an email to support@github.com with all of this info (and the repo name & location, naturally), but now (a day later) have yet to receive anything. I've checked that it's not in Spam. At this point, I've worked around it, but I want to delete this unusable repo. Does anyone have any suggestions for how to get in touch with GitHub? Sadly what finally worked was to gripe on Twitter. I got a reply from @githubhelp asking me to resend my original email. Not the answer you're looking for? Browse other questions tagged repository github git or ask your own question. Multiple users on one server working from a github repo? Permission / owner issue with pushing to git when editing directly from repo? 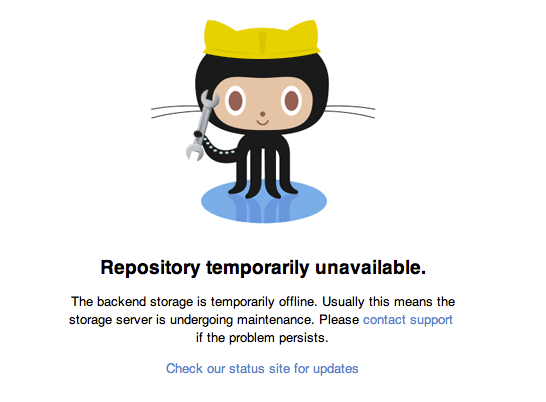 Deploy app from github without 2 repos?